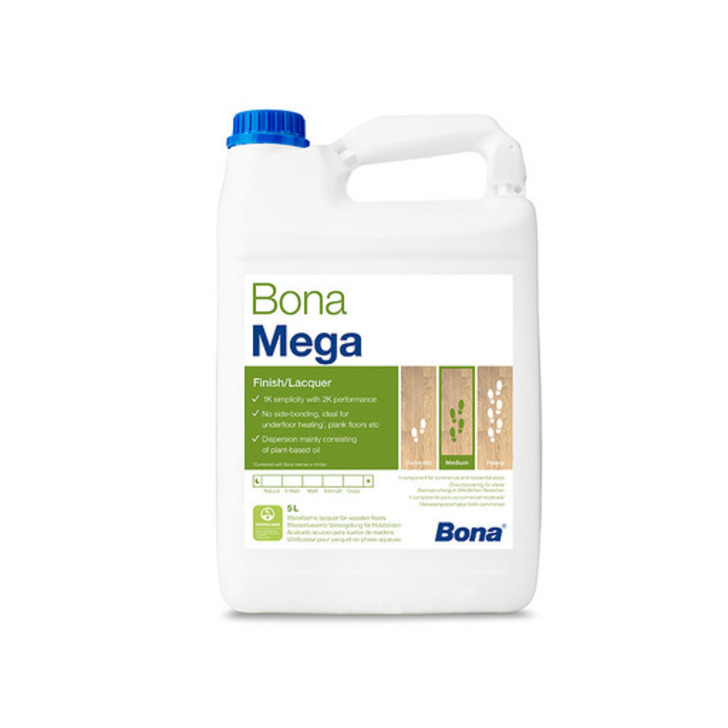 Bona Mega (in Silk finish) is a single component, waterbased, 100% polyurethane lacquer for the surface treatment of timber floors in commercial and domestic areas subject to heavy wear. As crosslinking is achieved using oxygen in the air, Bona Mega has the performance of a two-component finish without requiring a separate catalyst. It has all the advantages of a waterbased system, but still gives a deep, rich colouration similar to a solvent based finish. Bona Mega is available in ExtraMatt, Matt, SilkMatt & Gloss sheens. Overcoating previously varnished floors should be carried out with Crosslinker. You can choose between Matt, Gloss and Extra Matt. One of the greatest qualities of this lacquer is they way it dries. It's slow enough for the finish to level on its own and making it possible to apply it with a roller. Haven't found other product with the same specs. Also, it is very durable and resistant to scratches. So if you have the money buy it and think about it like an investment for the future. A great wood finish, it dries quickly and if applied well produces an even coat. I used it on my freshly sanded floors and added just the right amount of depth and colour. Would definitely buy it again.